Don’t become a victim. That’s easier said than done sometimes – especially when you are in a bind to move to a new apartment or home in your own town, or relocate to a new area. Job transfers can require quick moves. Making decisions under any stressful situation result in bad consequences. Occasionally there are unscrupulous people who want to take advantage of you. Your landlord will be checking your references – make sure you check their credentials as well. However, sometimes references are friends or family of the landlord that will give a glowing referral. There are other important methods to checking landlord’s legitimacy. That’s where doing your own homework comes in. Always check online for rental records, complaints and lawsuit history before signing any lease agreements. Sometimes even a call to the local Chamber of Commerce can yield results. Never rent without meeting the management staff and/or landlord at the premises you plan to lease. This won’t guarantee you aren’t being scammed, but it will certainly help when the landlord knows the premises. Also, check the county tax records so that you know exactly who owns the property. If the person showing the property is not the owner of record, verify the relationship between that person and the actual owner. See – touch – feel the property – and verify owner. The pictures might look good, but seeing is the only way to be sure. This is your security deposit, 1st and last month’s rent money at stake. Also, never pay exorbitant fees upfront. A security deposit, 1st and last month’s rent is generally accepted as standard throughout the industry. Anytime a landlord asks for more, be very suspicious. If it smells like a scam, it just might be one. Paying in cash is NEVER a good idea. Reputable property owners and managers will never have anything in the lease that can hurt you. By the same token, there will never be anything in the lease that will help you if you don’t make your payments and perform any obligations you have signed on to. A lease is a legally binding contract. Both the landlord and the tenant are protected by law. Always perform a “Pre-lease Walk-through” with the leasing agent. Make notations in writing and signed by both parties, of any flaws or damages that have occurred prior to the beginning of your lease. This will prevent any damages by prior tenants being charged to you upon termination of your lease. Your property manager will appreciate your diligence. 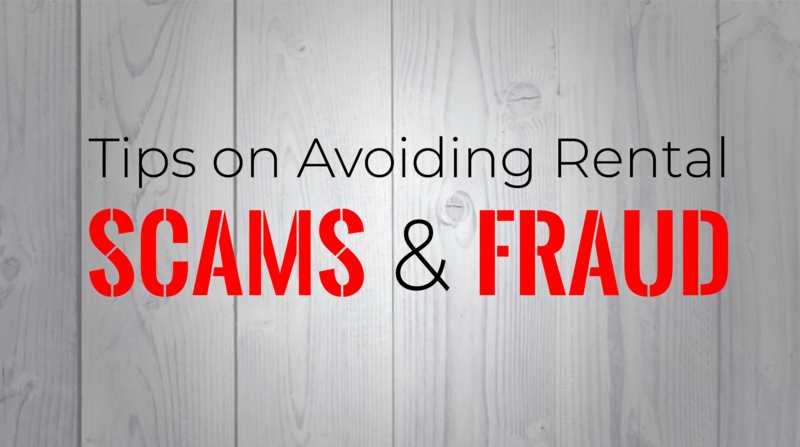 Legitimate leasing companies and landlords are not out to scam you. They are offering you a product you need in which they make money. It is strictly a business arrangement. They are not there to defraud you or make your life miserable. By doing your part to protect yourself and your money, you can enjoy your new surroundings with confidence in your decision.